MINNEAPOLIS — The Packers clung to a 19-13 lead heading into the fourth quarter of Sunday’s critical NFC North showdown with the Vikings. 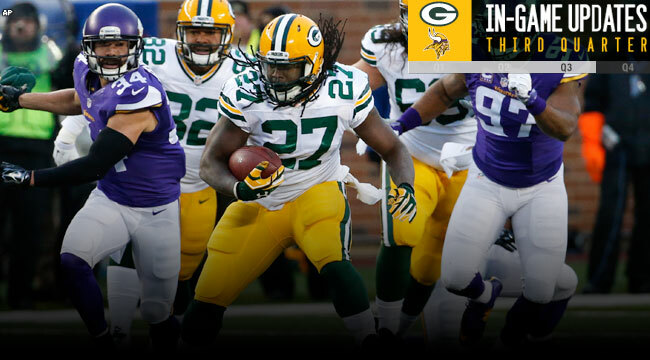 The Packers opened the second half with two runs by Eddie Lacy for a first down. James Starks then went 30 yards with a slip screen pass. Aaron Rodgers scrambled for 8 yards, leaving third-and-1 at the Vikings 36. Lacy pounded out 7 yards. Lacy of old continued to pound out yardage; he gained 8, then 2 more for a first down at the 19. The Packers eventually had to settle for a 42-yard field goal by Mason Crosby, 19-6. The Packers defense forced a punt and with 6:00 to play in the third quarter, the Packers had the ball at their 9 and were in control of the game, but they were unable to move the ball. The Vikings got it back at the their 37 with 4:37 to play in the quarter. Teddy Bridgewater completed a 17-yard pass to Stefon Diggs. He followed that with a 33-yard strike to Kyle Rudolph at the Packers 13. On second-and-3, Adrian Peterson went 6 yards over the left side for a touchdown that cut the Packers’ lead to 19-13 with 2:37 to play in the third quarter. Rodgers got the Packers moving with a 16-yard pass to Davante Adams. On third-and-6, Rodgers found James Jones streaking down the sideline, and Jones made a diving catch at the Vikings 28.